For years now Pilat has been offering Performance and Talent Management, Job Evaluation and 360 Feedback solutions. It also delivers bespoke offerings tailored to specific requirements that fit around client processes. Likewise, it offers Pilat First and Pilat Professional, designed to meet the requirements of an organisation that do not require a fully customized enterprise system. Pilat is designed to work with companies of every size and is used by a number of the most established and popular brands and companies worldwide. Either they prefer a small amount of tailoring using Pilat First as the basis (Pilat Professional), or a fully bespoke solution to exactly fit the requirements of an organization. One of the most obvious areas where Pilat excels is improving employee engagement and retention. This is an aspect of human capital management that many companies are focusing on now as the need for highly qualified and talented individuals is increasing the number of such professionals is becoming low, thus making the competition fierce and exciting. Pilat helps companies succeed in this area. 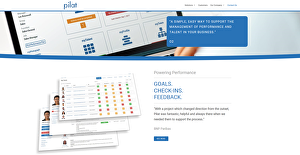 Pilat offers robust and user-friendly performance and talent management solutions that can be easily adapted to your processes and not the other way around. The software doesn’t believe in a one-size-fits-all approach and enables users to perform the necessary tweaks and modifications to ensure that the software fits perfectly into their existing workflows. In addition, you can have all these without shelling so much money. It is both intuitive and cost-effective, a premium software without the premium price tag. Pilat is built to serve international companies that employ thousands of workers and operate tens of branches and office around the world. The system is more than capable of bridging any gap in the human capital management process. Pilat offers all the functionalities you look for in an HCM solution as well as total visibility of your business, people, and data. With such easy and immediate access to people data, companies are able to devise and implement viable strategies in the future on how to maximize the utilization of their people. What Problems Will Pilat Solve? A leading US-based energy company had signed a contract with a Tier 1 supplier for all of their Human Capital requirements. Upon further investigation, it became clear that there would be a significant delay in implementation. The company then switched to Pilat. The move helped them deploy a fully functioning PM and TM solution in less than 6 months. All of this at a fraction of their original budgeted costs with the larger supplier. If you are considering Pilat it might also be a good idea to analyze other subcategories of Best HR Software listed in our database of B2B software reviews. There are popular and widely used applications in each software group. But are they essentially the best fit for your company’s unique needs? A trendy software application may have thousands of users, but does it provide what you need? For this reason, do not blindly invest in popular systems. Read at least a few Pilat reviews and think about the factors that you wish to have in the software such as the cost, main functionality, available integrations etc. Then, select a few apps that fit your wants. Check out the free trials of these apps, read online comments, get information from the seller, and do your homework thoroughly. This exhaustive research is certain to help you select the most excellent software solution for your company’s unique requirements. How Much Does Pilat Cost? We realize that when you make a decision to buy HR Software it’s important not only to see how experts evaluate it in their reviews, but also to find out if the real people and companies that buy it are actually satisfied with the product. That’s why we’ve created our behavior-based Customer Satisfaction Algorithm™ that gathers customer reviews, comments and Pilat reviews across a wide range of social media sites. The data is then presented in an easy to digest form showing how many people had positive and negative experience with Pilat. With that information at hand you should be equipped to make an informed buying decision that you won’t regret. What are Pilat pricing details? What integrations are available for Pilat? If you need more information about Pilat or you simply have a question let us know what you need and we’ll forward your request directly to the vendor.